Lalgarh jattanis a big village in farm not only population but also in field .In 1948 total field area calculation is 16000 hact.and now it 52000 hact.There are many small area included in this village are.10PBW,16SDS,CHAK KERA,3LNG,10-12SDP,9LLG,ROTAWALI,SIHAGAWALI.The water supply for all field area come's in four mini kenal from main bhakhra kenal.Total Farm area of lalgarh jattan is 52000 hect..and Cultural area is 50,000 hect.and Irrigated area is 20,000 hect. Living area is 50,000 hect.Total rain fed area is 48,000 hect. 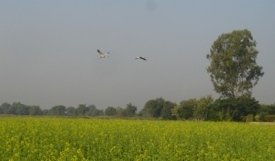 The initial idea of setting up the farm was to increase the food production.The main crops range from wheat and millet in the drier areas to sorghum, cotton, maize, oilseeds, sugar cane, tobacco, rice etc.The Lalgarh jattan Subcontinent supports a predominantly agricultural way of life where there 70 percent of the work force is employed in farming.Most farmers are peasant cultivators of small area of land. The land is often ploughed using traditional methods. Farmers rely upon local knowledge of soils and environmental conditions as soils may very enormously from village to village.In This village about 80 percent of the population live in rural areas and depend on agriculture. 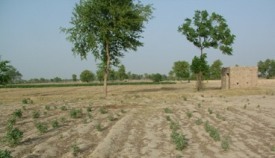 Rainfall in the Lalgarh jattan is sparse and unreliable and less than 20 percent of the cultivated land is irrigated. The Bhakra canal provides irrigation to the arid western village of lalgarh jattan.In Recently years, drought have exacerbated problems of desertification in lalgarh jattan and additional projects are underway or planned to bring more irrigation to the farmers.The old methods of ploughing fields are still continuing by using camels and bulls. Now a days farmers are using tractors for this purpose.The use of chemical fertilizers and pesticides has increased for the crop productivity.in Lalgarh jattan Irrigation mostly depends on rain but men made water ponds are also used for this purpose.The Water is available from Bhakra canal .So many projects are running by the government and private NGO's to overcome the problem related to irrigation.